What is the head stamp on the brass? That would be important to those who reload. 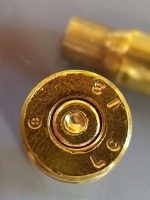 rlandry6 wrote: What is the head stamp on the brass? mp15spt2 wrote: I wanted to leave my feedbacks for Global. I had purchaded the Group Buy..... 2 for 1 deal...Global shipped out the item very quick compared to other Vendors and the flat rate shipping was the deal closer. Glad to hear. Should you have any questions of us at all, please don't hesitate to give us a call at 941-549-8388. We appreciate the kind feedback for sure! I had a chance to drive out to the country to visit my dad a put a few rounds through the rifles today. I bought 2 cases of ADI when they were on sale and after shooting 20 or so today, I wish I had bought 2 more cases. While I wasn't shooting for precision since I was trying to sight in my new Holosun red dot I picked up from PSA, I would say this ammo shoots as good as any other commercial ammo I've fired. In my amateur hands it's a 1.5 MOA round. I'm sure an experienced shooter with a steadier hand and something better than a mil-spec trigger could do much better. 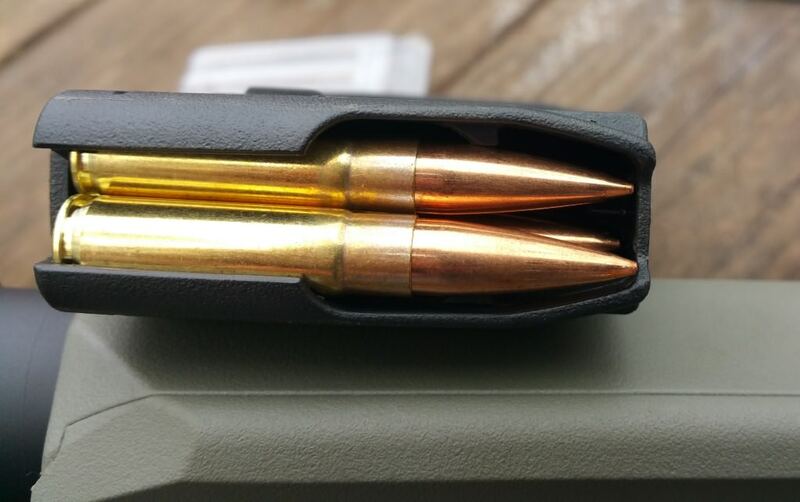 One thing I noticed is these are LONG, almost touching the inside of the magazine but I had no failures to feed or eject in either rifle with the limited shooting I did. 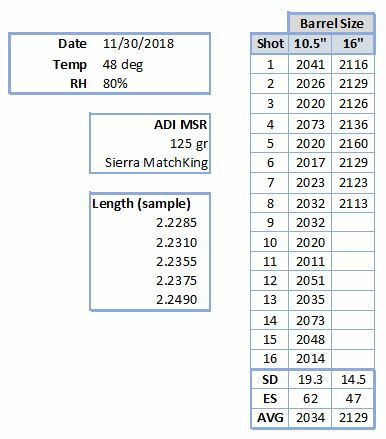 Below is a chart of the chrono data I capture for each barrel. Am I seeing tis right? It. Looks lke there is only 95fps difference between the 16 and 10.5 inch barrels. That sure paints a picture of the cartrdges efficiency. I ordered two cases and look forward to trying them out. As soon as we get some warm weather! I ordered four cases on Sunday, shipping was $13 to S.C. and arrived today. With shipping it comes out to under 42cents/round. Cheaper than Magtec. ADI’s 69 gr. matchking 5.56 is one of my favorite precision loads with a heavy bullet. Also some of the best packaged commercial ammo, every 5 rounds is ‘blister packed’ together. Hoping this shoots as well. GO threw out a great deal here and shipped fast & cheap. If I hadn’t blasted my cc with Black Friday sales I’d have grabbed more. This deal is over looks like they ran out. There's a new similar deal now though. This are different, they have a black case. Looks like a black oxide coating on a brass case. Never seen this before, this a good thing? Thank you for the kind feedback, truly appreciated. This 125gr is back in stock. Shot some today out of my 16” Wlson Combat barreled AR and my RARR in a quick range session to assess if it was worth ordering some more. Distance was 90 yards; scopes were 4x (Leupold VX-R on the RARR and Millett DMR on the AR); shooting rest was a field-expedient landscape brick with a towel on it; rate of fire was moderate. And I was freezing my tuckus off. So, I believe this ammo to be MOA were I to take my time with it. And at the price, how can I not buy some more? I saw the comment of length. They are long. I had FTFs out of two older aluminum GI mags in a plinking session a week ago, but flawless feeding out of Pmags. In the GI mags the point would hang up on the front of the mag.